When it comes to a Marine Electric Water Heater for Boats, these low cost 6 gallon hot water heaters are a quick and simple way to supply hot water to your kitchen, your bathroom, or your shower. The 1500 watt element allows for installation on a 15amp circuit breaker, and also for quick hot water recovery times when you have high water demands. 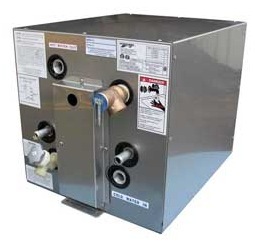 These water heaters are powered by your 120v shorepower, or also via the heat exchanger connections to use the energy from your engines cooling system to heat the 6 gallon tank. Hot water heater found on houseboats. Enjoy hot water heated dockside with 120V AC power or with engine heat when underway. Heaters feature a marine-grade aluminum case and cladded aluminum tank with 1500W heating element and large diameter, dual-loop heat exchanger. Circuitry is ignition protected, and each heater includes a high-temperature limiter with automatic reset. All plumbing and electrical connections are “front” located. Use of a magnesium anode is recommended to extend tank life. Note: please allow @ 1 week for free shipping. Purchase this Marine Water Heater here. 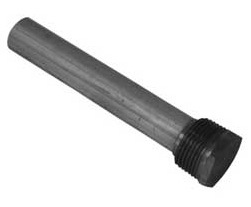 Purchase this Magnesium Anode now.